Dew point monitor for chilled ceilings etc. X-SENS-TEMP-RH-EXH sensors are control components for integration with control systems such as X-AIRCONTROL. The sensor consists of two sensor heads for measuring temperature and relative humidity. The duct sensor variant is intended for use in circular or rectangular extract air ducts. 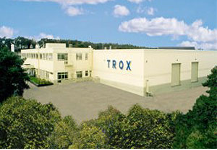 Measuring ranges are –40 to 120 °C and 0 to 100% relative humidity. A Modbus RTU data interface is used to transmit measured values to the control system. A plug-in connection cable with an RJ12 plug simplifies installation. The zone module automatically recognises the sensor (plug and play). X-SENS-TEMP-PT1000 temperature sensors are control components for integration with control systems such as X-AIRCONTROL. The temperature sensor is a PT1000 sensor. The duct sensor variant is intended for use in circular or rectangular supply air ducts, or preferably in extract air ducts, as an alternative to a room temperature sensor. Measuring range: –40 to 85 °C. The zone module automatically recognises the temperature sensor (plug and play). 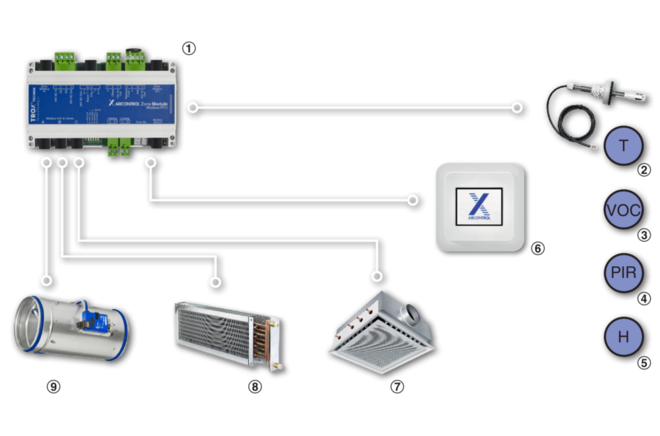 X-SENS-VOC air quality sensors are control components for integration with control systems such as X-AIRCONTROL. The air quality sensor measures the concentration of volatile organic compounds such as alcohols, aldehydes, ketones, esters, terpenes, aromatic compounds, and alkenes. The duct sensor variant is intended for use in circular or rectangular extract air ducts. Measuring range: 450 to 2000 ppm. X-SENS-CO2-RH sensors are control components for integration with control systems such as X-AIRCONTROL. The sensor consists of two sensor heads for measuring CO2 concentration and relative humidity. The room sensor variant is intended for use in a room. The precision of CO2 concentration measurements is maintained by cyclical self calibration. Measuring ranges are 0 to 2000 ppm and 0 to 100% relative humidity. Measured values are transmitted to the control system via 0 – 10 V DC analogue signals. X-SENS-PIR-SM motion detectors are control components for integration with control systems such as X-AIRCONTROL. 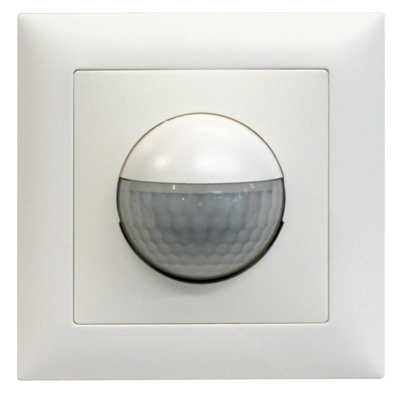 The motion detector includes a PIR sensor (passive infrared) for detectiong people in a room, i.e. occupancy. The flush mounted variant for mounting on a wall has an operational range of 180°. The condition (i.e. if the room is occupied or not) is transmitted to the control system via a volt-free digital output. X-SENS-PIR-FM motion detectors are control components for integration with control systems such as X-AIRCONTROL. 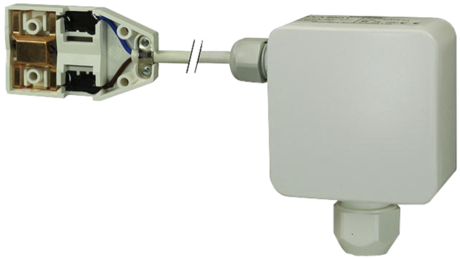 The motion detector includes a PIR sensor (passive infrared) for detectiong people in a room, i.e. occupancy. 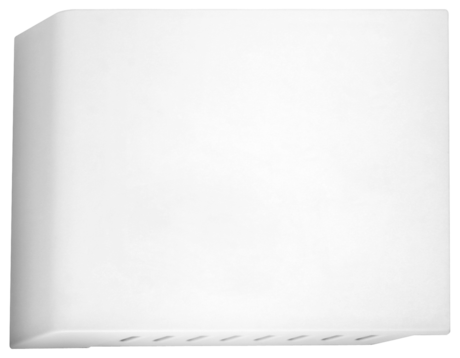 The surface mounted variant for mounting on a ceiling has an operational range of 360°. X-SENS-DEWPT dew point monitors are control components for integration with control systems such as X-AIRCONTROL. The dew point monitor contains a humidity sensor for measuring the relative humidity near the dew point (100% rh). The goal is to ensure that the dew point is not reached, i.e. that condensation is avoided. The condition is transmitted to the control system via a volt-free digital output. X-SENS-SPLITTER four-way splitters are used to connect up to three sensors and actuators to an interface, e.g. to an interface of a zone module within X-AIRCONTROL. The four-way splitter can also serve as an adapter to connect air quality and temperature sensors to terminals in case the connection cables have bare wire ends. The actual connection to the zone modules is done with RJ12 plugs. Volt-free contact, 230 V AC max., 1 A max. Combined temperature and humidity sensor for rectangular and circular extract air ducts. Ready-to-operate sensor which consists of a casing with flange, a protective tube with two sensor heads, and a connecting cable with RJ12 plug. Modbus RTU data interface for the transmission of measured values to the control system. 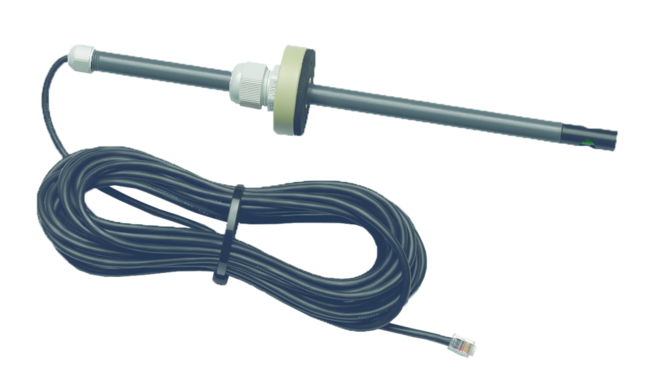 Temperature sensor for rectangular and circular extract air ducts. Ready-to-operate sensor which consists of a protective tube with flange, a sensor head and a connecting cable. Sensor for measuring the concentration of volatile organic compounds in rectangular and circular supply or extract air ducts. Ready-to-operate sensor which consists of a protective tube with flange, a sensor head, and a connecting cable with RJ12 plug. Sensor for measuring the CO2 concentration and humidity in rooms. Ready-to-operate sensor which consists of a casing with two sensor heads and connection terminals. Ready-to-operate detector which consists of a casing and a PIR sensor (passive infrared). Switch output (volt-free contact) for the transmission of the detected condition (occupied or not occupied) to the control system. Sensor for monitoring the dew point on chilled surfaces. Ready-to-operate sensor which consists of a casing and a sensor head in a separate casing. Response time: 3 minutes max. Exposure to condensation: 30 minutes max. Switch output: Volt-free, 230 V AC max. 1 A max. Four-way splitter for the connection of four sensors or control panels (Modbus). Adapter used to connect up to four components to terminals in case the connection cables have bare wire ends; also to connect RJ12 plugs. The maximum cable length is 30 m.